Fantasy Mosaics 11: Fleeing from Dinosaurs is rated 4.0 out of 5 by 12. Rated 5 out of 5 by Audreyrpeters from Best One Yet! This version of Fantasy Mosaics is as good as it gets and my favorite so far in the series. The pictures were brilliant in the use of color and design. They made me smile often upon completion. :-) The puzzles are a perfect level of difficulty using logic and occasionally a little hint. I am sure I will play Version 11 many, many times. Rated 5 out of 5 by SkyeGray from Ready for a 4th Color! I'm the last person in the world to get addicted to nonograms; I'm a dyed-in-the-wool HOG player. I love Fantasy Mosaics whether they improve them or not; they make other nonograms feel tiresome and unwieldy. In addition, the stories about the penguins are so unrelated to the pictures that I find a quirky pleasure in them. For instance, when the penguins were in dinosaur land, you might expect to find pictures of conifers, cavemen etc. Nope. You get ping pong, roller blades and the tango. In general I'm a proponent of "if it works, don't fix it," (I know. I know I have to move on from Dark Parables.) but I think we are ready for a 4th color. The pictures in this game were more complex, but not much more difficult, which is okay with me - but I can envision a really beautiful game with complex pictures that look like embroidery, in many colors. Come on guys, you're on the right track. Step up! Rated 5 out of 5 by alowan from They're at it again... ...giving us a great game! Mr. Penguin and his adventures were my introduction to the nonogram - now my favorite kind of game! I love the angry, or cynical, or impatient, or whatever it is (depending on my mood) Mr. Penguin. I love that a finished row/column's blank spaces automatically fill in. I love it that they cross off all completed numbers at the top or left, instead of leaving a few for us to guess at - though there are times I like that challenge. I love it that we've been offered two Penguinonograms so close to each other! I am a Happy Fishie today! Rated 5 out of 5 by sunnyglow from A GROUND SHAKING EVENT AWAITS THE PENGUIN FAMILY – “THE ESCAPE FROM DINOSAUR LAND” WOW! A Happy Halloween Christmas to all this week! What a great week for gaming! What a WONDERFUL surprise! Thank you so much BFG! I LOVE these games! Our little penguin has returned (this time with his family) with another Griddler (AKA O’Ekaki, Paint-by-Numbers, Pic-a-Pix, Nonograms or whatever you call them) puzzle game. This an EXCELLENT game from the best developer for this type of game – Match Gems. Through a series of logic puzzles, relive the terrifying and ground shaking events of the past as our little penguin and his family escape the land of the dinosaurs! Yikes! HOW TO PLAY: This is variation of a Sudoku puzzle. In this puzzle, create pictures by filling in squares in a grid. The grids in this game will vary in number from 5 x 5 to 20 x 20 if it is like the games of the past. Each side of the grid will have numbers for each line of squares indicating the amount of squares which are to be filled in for each line of squares. Squares are filled in where the squares intersect between the two sets of numbers on each side. • Levels: Casual and Advanced. • Colors: Each puzzle has three (3) colored screens • Autofill: There is autofill so you do not have to fill in the unused boxes. • Hints: Hints are given as you proceed and are based on the difficulty of the puzzle and how well you perform in solving the grid • There are 100 griddlers - 20 levels with 5 griddlers for each level. The puzzle grids become larger and more difficult as you proceed in the game. • Aids: You will receive aids in the game such as a pickaxe. • Awards: You will receive gold, silver and bronze trophies based on the amount of mistakes you make. If you make too many mistakes, you must restart the puzzle • Garden: As you complete a level you will receive an item to place in your “garden.” An excellent colorful griddler game! 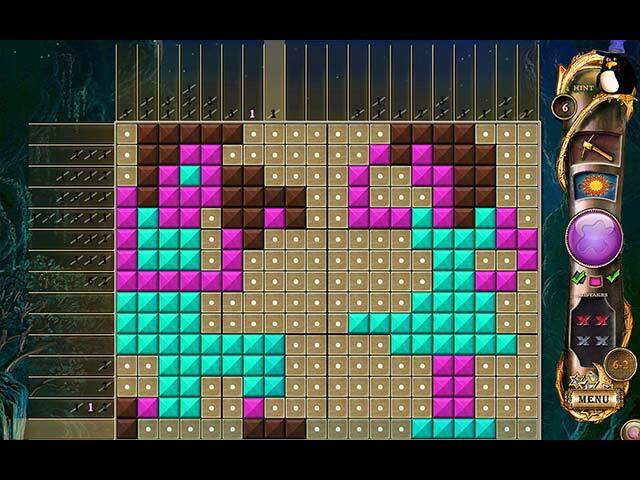 Match Gems produces the best griddler puzzles of all the devs who produce these games for BFG. I highly recommend this game if you like Sudoku games or any type of mathematical games. Rated 5 out of 5 by pennmom36 from A Safer Home I tried to tell Mr. Penguin last time, dinosaurs weren't friendly, to stay away! Looks like he finally found a place free from dinosaurs, let's keep our fingers crossed. As with all Fantasy Mosaics puzzles, every step you take in the game will help the penguin explore this new world, and help him flee from the land of the dinosaur. This is a griddler or mosaic type puzzle game where you fill in and cross of cells on various sized grids, using logic. There are groups of numbers located on each column and row of the grid, each group of numbers must be separated by at least one blank or crossed off cell. Sometimes it's easier to figure out where numbers can't possibly fit to reduce the amount of cells and narrow the playing field down a bit. Some cells contain bonuses such as extra hints, extra mistakes allowed or an extra pickaxe which allows you to choose which cell you want a hint on. There is a Sun icon as well that when fully charged, will give you a mega hint, filling in or crossing off a 3x3 area of your choice. The one feature that makes Fantasy Mosaics stand out from the rest of the griddler games, is the vibrant array of colors available. It can also help you solve the puzzle when you get stuck, because you can switch to another color which ultimately narrows down the available cells. Unlike many griddler games, these pictures actually make sense, because they have three different colors you know what image you have created, such as bellflowers or a centaur. If you make no mistakes, you will earn a Gold Trophy regardless of the time it takes to complete the puzzle, a Silver Trophy is earned if you make one mistake, and a Bronze Trophy is earned if you make 2 mistakes. You can replay the grid as often as you want in order to improve your trophy status. This series is one of the best available, and certainly the most colorful. This is a must have game for griddler geeks and an immediate purchase for this geek, enjoy! Rated 5 out of 5 by biscuitsmama from A MORE CHALLENGING GAME RIGHT FROM THE BEGINNING Fantasy Mosaics 11 is here and it is as wonderful as the other games in the series. This time our penguin family has left behind the inhospitable prehistoric world and is now ready to find a new forest home. Join them on a new adventure as you solve the colorful and challenging boards in Fantasy Mosaics 11. The multi-colored boards are as crisp and colorful as usual accompanied by gorgeous background graphics. I love the relaxing background music that soothes me as I play through the levels. One of the things I noticed right away is that from the very beginning the boards seem a bit more challenging. In previous games the boards were fairly easy to complete but not so with Fantasy Mosaics 10 and now 11 that follows with that increased level of challenge. It goes without saying that this game was an instant buy for me. I have all of the other Fantasy Mosaics games and never tire of them. 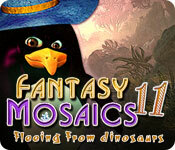 I was very thrilled to see Fantasy Mosaics 11 as today’s soft release. If I have one complaint it is simply that we have to wait so long to get these fantastic games because they have been released elsewhere for weeks. Maybe BFG can try to offer the Fantasy Mosaics games as soon as other distributors in the future. 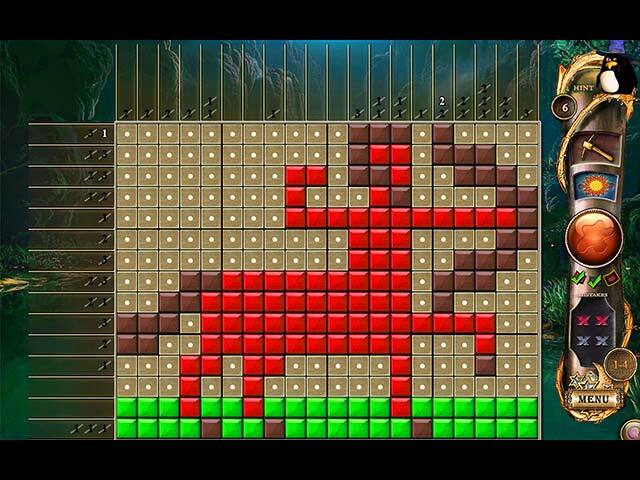 I recommend that you try the demo to see if you will also love the Fantasy Mosaic games. Rated 5 out of 5 by arnold1049 from KEEP THEM COMING All of the games in this series are excellent. The colored tiles make the completed mosaics very eye catching and playing each color one at a time keeps the game interesting. I played the advanced mode, which means that the numbers at the top of the row or column will not cross off until you have revealed all the right tiles. There are 20 locations and within these 20 locations are 5 mosaics to complete. Winning a gold cup for each mosaic requires that the mosaic be completed with no mistakes. They can be replayed as often as you want in order to obtain the gold cup. 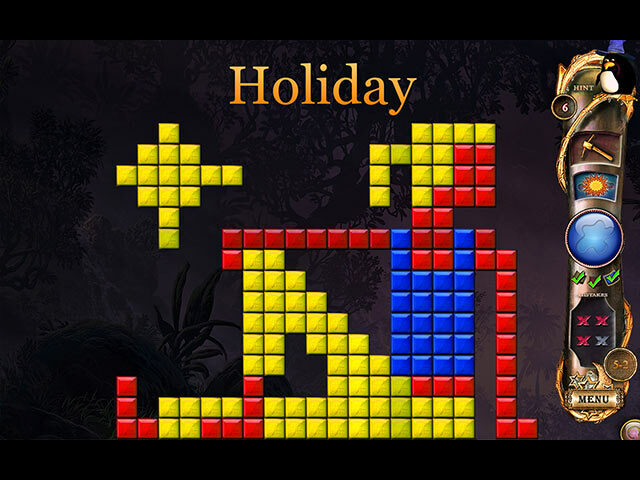 The mosaics must be completed in order; the next one is not unlocked until the current one is completed, but obtaining a gold cup is not necessary to unlock the next scene. And each location must be completed before the next one is unlocked. Completing each location adds an item to the garden. Each mosaic starts with one hint, but during game play, additional hints are added. At first you can only make 2 mistakes before you have to start the mosaic over. During game play, the number of allowed mistakes increases, but I'm not sure what affect making these additional mistakes has on the level of award earned. I think a gold cup still requires zero mistakes, a silver cup only one mistake, etc. The only thing the additional allowed mistakes makes is that you can make more mistakes before being required to start over. There are two other ways to get help during play. Each of these requires quite a bit of time for them to reload before they can be used again. One is a pickaxe that will reveal any tile you set it on and click. Very useful when you have 12 tiles and only ten need to be revealed. Using the pickaxe will narrow down the choices for selecting the correct tile. The other help is a starburst that reveals a 3x3 grid of tiles around the spot you click on the mosaic with it. These games are certainly addictive. Rated 4 out of 5 by kreative_ily from good, but could be better I really do like the nonogram games and this one is very consistent. There is a wider spectrum of colors which could be used for these puzzles & I wish they could use some more realistic colors. Also need and english spellchecker - There is usually at list one misspelling per game. Rated 3 out of 5 by seniorspeed0 from Latest Fantasy Mosaic Midway through this latest game I began to notice that some of the puzzles were repeats from Fantasy Mosaics #10. That was a bit disappointing to me. Also, I would like to see more bright colors in the puzzles. I first came across this type of puzzle in a crossword puzzle book, and I loved it. I really enjoy this format as well! Thank you!